Standard Motor Products (SMP) has announced the start of its Standard ‘Bigger, Better Diesel’ Automotive Scholarship Contest. 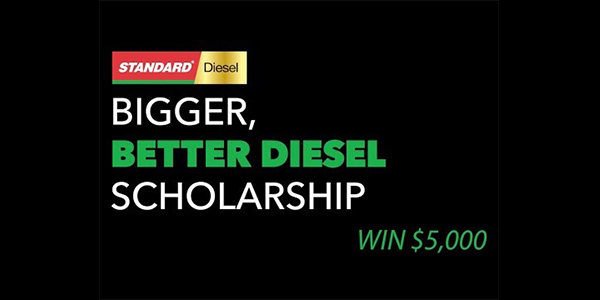 Running through May 31, the second-annual competition will present four up-and-coming diesel technicians with a $5,000 scholarship each. Students can enter by visiting BiggerBetterDiesel.com, completing an online questionnaire and submitting a recent photo of themselves. Judges will evaluate entries based on relevance, creativity and thoughtfulness relating to the automotive industry with an emphasis on diesel technology. The contest is open to legal residents of the 50 United States and the District of Columbia. Eligible entrants must be between the ages of 18 and 34 and currently enrolled full-time in high school or in an accredited two- or four-year college, university, or post-high school educational program. Complete rules and program information can be found at BiggerBetterDiesel.com. For more information, watch the promotional video on youtube.com/StandardBrandParts.